For other places with similar names, see Araba. 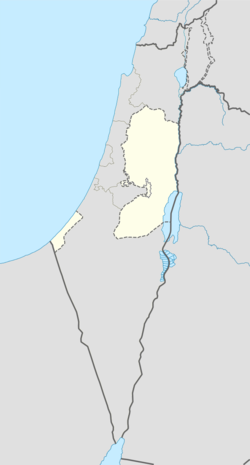 Arraba (Arabic: عرّابة‎ ALA-LC ʻArrābah), also Arrabah, Arrabeh or Arrabet Jenin, is a Palestinian town in the northern West Bank located 13 kilometers southwest of Jenin. It has an elevation of 350 meters above sea level and lies near Sahl Arraba, a plain that lies between Mount Carmel and Nablus. According to the Palestinian Central Bureau of Statistics (PCBS) census, Arraba had a population 9,920 in 2007. The lands of Arraba include Khirbet al-Hamam and Tel el-Muhafer, either of which believed to be the site of the Canaanite town Arubboth from the Books of Kings (Rubutu in the Egyptian documents) and the city Narbata of the Roman period. Tell Dothan is located just north-east of Arraba. Pottery remains from the late Roman, Byzantine, early Muslim and the Middle Ages have been found here. In 1229 Yaqut noted that the village had a holy place named after the Prophet Arabil. During the Crusader period, ‘Arrabeh appears as one of the settlements marking the eastern boundary of Caesarea district. Arraba, like the rest of Palestine, was incorporated into the Ottoman Empire in 1517, and in the census of 1596, the village was located in the nahiya of Jabal Sami in the liwa of Sanjak of Nablus. It had a population of 81 households and 31 bachelors, all Muslim. 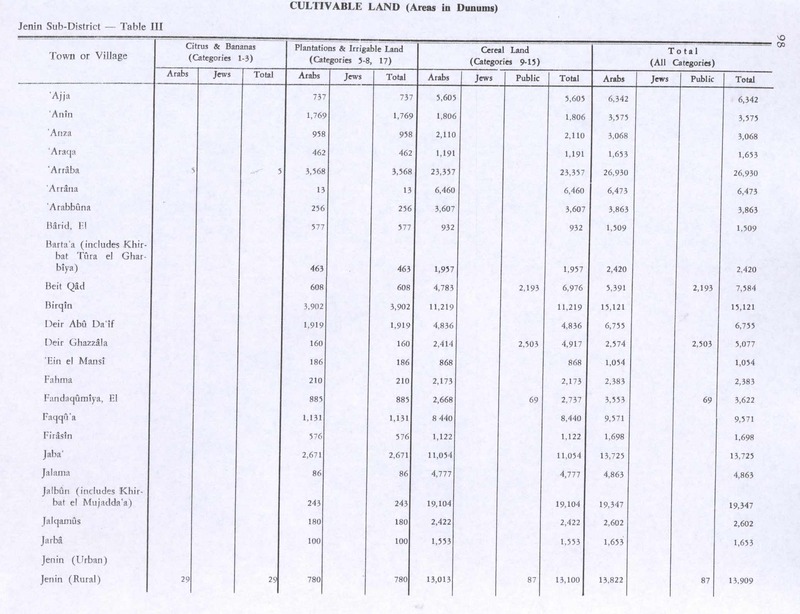 The inhabitants paid a fixed tax rate of 33.3% on agricultural products, including wheat, barley, summer crops, olive trees, occasional revenues, goats and beehives, and a press for olives or grapes; a total of 29,575 akçe. In 1838 Arrabeh was noted as a village in the esh-Sharawiyeh esh-Shurkiyeh (the Eastern) district, north of Nablus. Arraba is the origin of the Abd al-Hadi clan, once a leading landowning family in the districts of Afula, Baysan, Jenin, and Nablus. The clan was traditionally opposed to the Tuqan clan of Nablus. In the 1850s the Ottoman rulers withdrew their soldiers from the district (to be used in the Crimean War), and hence open hostility ensued between the different Palestinian factions. The Abd al-Hadis sacked several villages, some of the results were shown to the British consul Rogers when he visited Arraba in 1856. In April 1859 a coalition of Ottoman troops and local leaders opposed to the Abd al-Hadi clan, stormed Arraba. Members of the Abd al-Hadi clan either fled or were captured, while the fortifications of Arraba were razed and the place plundered. By subduing Arraba, the Ottomans had suppressed the last bastion of independent local rule in the Nablus region. French explorer Victor Guérin visited the village in 1870, and described it: "This town is situated on a plateau. ... It is divided into three quarters, one of which was once surrounded by a wall flanked with small towers. This wall is now in great part destroyed, having been overthrown in a siege sustained some years ago during a revolt against the Caimacam of Nablus". In 1882, the Palestine Exploration Fund's Survey of Western Palestine described Arraba as "a very large village on the south slope of a ridge, the northern houses on high ground. There is a small mosque in the centre, and one or two large buildings, including the Sheikh's house. The water supply is entirely from wells within the village, and on the road-side towards the north. There is a ridge of very barren rock between the village on the south and the plain (Merj 'Arrabeh) on the north. Scattered olives grow round the village, but the immediate neighbourhood is very bare. The villagers are turbulent and rich, owning very fine lands in the northern plain." In 1913-14 the Ottomans built a section of the Jezreel Valley railway (itself a branch of the now-defunct Hejaz railway) that passed through Arraba and ended in Nablus. In the 1922 census of Palestine, conducted by the British Mandate authorities, Arraba had a population of 2,196, all Muslim. 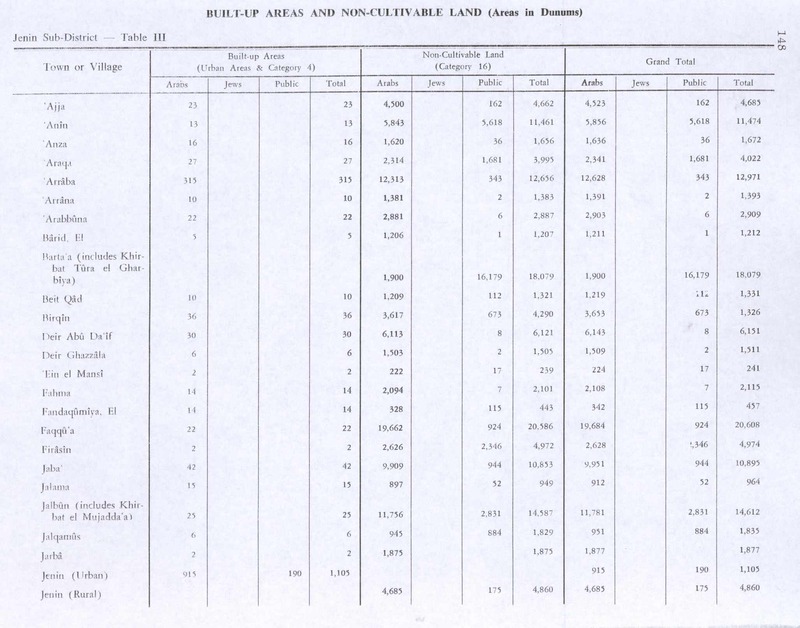 In the 1931 census it had increased to a population of 2,500, still all Muslim, in 554 inhabited houses. In the 1945 statistics the population was 3,810 Muslims with 39,901 dunams of land, according to an official land and population survey. five dunams were used for citrus or bananas, 3,568 dunams were used for plantations and irrigable land, 23,357 dunams for cereals, while 315 dunams were built-up (urban) land. In the wake of the 1948 Arab–Israeli War, and after the 1949 Armistice Agreements, Arraba came under Jordanian rule. In 1961, the population of Arraba was 4,865. Since the Six-Day War in 1967, Arraba has been under Israeli occupation. ^ Hütteroth and Abdulfattah, 1977, p. 128. Note typo in grid number, see talk. ^ Lesch, Ann M.; "Abd al-Hadi Family," Encyclopedia of the Modern Middle East and North Africa. ^ Doumani, 1995, Chapter: Egyptian rule, 1831-1840. ^ Guérin, 1875, pp. 218 ff, as translated by Conder and Kitchener, 1882, SWP II, p. 154. Guérin also wrote: "Arrabeh has certainly succeeded an ancient town of which no mention is anywhere made. Probably it bore the name of the present town. There still remain cisterns cut in the rock, and a great many cut stones built up in modern houses. Before the Mohammedan conquest a church stood here, from the materials of which a mosque has been erected. This is now, in its turn, falling into ruins. We remarked above the entrance a beautiful monolithic lintel in white marble, in the middle of which was formerly engraved a cross with equal branches, which the Moslems have chipped out. It occupied the middle of a rectangle flanked by two triangles, one on either side, all three framed in a kind of rectangular cartouche. The lintel is alone sufficient to fix the date of the church at the period assigned by me. The church was decorated internally with columns having Corinthian capitals, and fluting half spiral, half vertical. Some fragments of the shafts still remain in the mosque, together with a beautiful piece of frieze formerly sculptured with interlaced links." Finn, J. (1878). Stirring Times. 1. London: C.K. Paul & co.
Finn, J. (1878). Stirring Times. 2. London: C.K. Paul & co.
Gilbar, Gad G. (1990). 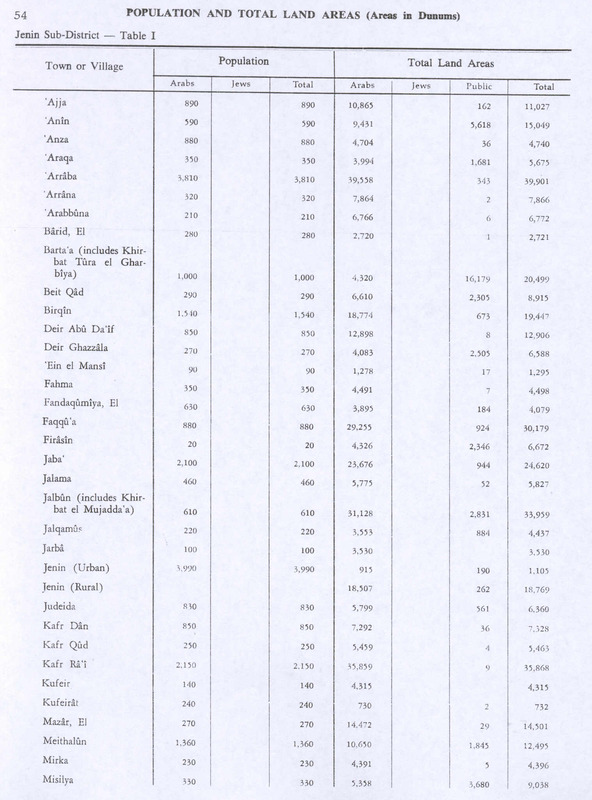 Ottoman Palestine, 1800-1914: Studies in Economic and Social History. Brill Archive. ISBN 90-04-07785-5. Na'aman, Nadav (2005). Canaan in the second millennium B.C.E. Eisenbrauns. ISBN 1575061139. Poujoulat, B. (1861). La vérité sur la Syrie et l'expédition française. Gaume frères et J. Duprey. Rogers, Mary Eliza (1865). Domestic life in Palestine. Poe & Hichcock. Schölch, Alexander (1993). Palestine in Transformation, 1856-1882: Studies in Social, Economic, and Political Development. Institute for Palestine Studies. ISBN 0-88728-234-2. Stephan, St. H. (1938). "Evliya Tshelebi's Travels in Palestine". The Quarterly of the Department of Antiquities in Palestine. Zertal, A. (1984). Arubboth, Hepher, and the Third Solomonic District (in Hebrew). Zertal, A. (2016). The Manasseh Hill Country Survey. 3. Boston: BRILL. ISBN 9004312307.